Like the Parade lap of a Grand Prix what should of been remembered was forgotten. A Club so long without a trophy won it. A game that had been equally fought, well Refereed and narrowly won was cast aside. Gone was the Glory of the first Goal as was the Screamer from the Local Boy. The Captain’s winning header washed away by the tears of the Young children hurried away from the Stadium moments after Full Time. The fault lies solely and Completely in Leith. The moment of Joy of victory soured by over three thousand of their own invading the pitch. The late winner from Captain David Grey and more importantly his running into the Legions of Leith breaking the most important defensive boundary on a football pitch. The invisible wall that keeps the Spectators in the Stands and the players safe on the pitch. A crime he got Booked for by Referee and no doubt should be Questioned by Police Scotland. It was a day of crossing the line for Hibernian. After One Hundred and Fourteen Years Alan Stubbs Men finally reunited Easter Road with the Scottish Cup. As the final whistle sounded the lines so clearly marked became blurred in the euphoria for the Hibees. Let’s look calmly at the events. Thousands clad in the Colours of Hibernian streamed over a Wall, they then ran forty metres, vaulted advertising holdings and continued onto the playing surface. Continued towards the half way line spitting and punching Rangers players. Once they got to the Halfway line other Members of Ibrox Staff became Targets for Violence. Let’s not pretend it was a joyous celebration or “Over Exuberance” this was Public Disorder. Let’s not forget in 1980 the last time Police Horses graced Hampden’s turf Football Stadia (Scotland) Act was hastening brought into law. In the year finally Football Fans were declared Innocent of wrongdoing and Contributing to Hillsbourgh. Edinburgh Hibernian gave the David Duckenfield’s of this world a reason to justify their belief that ALL football fans are Animals to be treated with contempt. Any assault by Hibernian Fans on any Rangers Staff will no doubt have to be treated as Sectarian Aggravated Assault by Police Scotland some even Racist. Let’s face it on Saturday Morning Hibernian as a Club did not know how to Win the Scottish Cup, by the time the Dregs of Society left Hampden it was crystal clear NO ONE of a Hibs persuasion knew HOW TO CELEBRATE winning the William Hill Scottish Cup. Hibernian Football Club lost all Dignity and Credibility Hampden. The simple truth is the Party stopped at the white lines of the pitch. If it was a party why did Hibs Hoards cross the halfway line. The trophy gets presented immediately above the Halfway line. Why if it’s EXUBERANCE where fans running goading the quickly emptying West Stand and the Western Half of The North and South Stands where Rangers fans sat. If you’re party mode involves spitting, punching and Kicking out at others then whatever party is being held in Easter Road tonight I do not think many members of Humanity want an invite. Stuart Regan was as damning as he could be. He could not issue punishments as that needs reflection and time to gather facts. 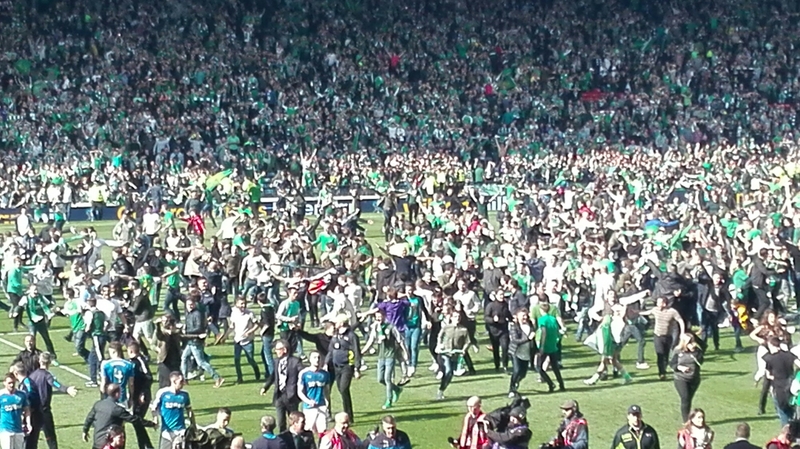 I am sure the decision to present the oldest Trophy in Football to David Grey was only upon Police orders made on the hoof (possibly even on horseback on the damaged pitch) to avoid a further out break of Exuberance leading to full scale Riot. Hibernian should of been handed the Cup and medals in the Away Dressing Room with no ceremony. 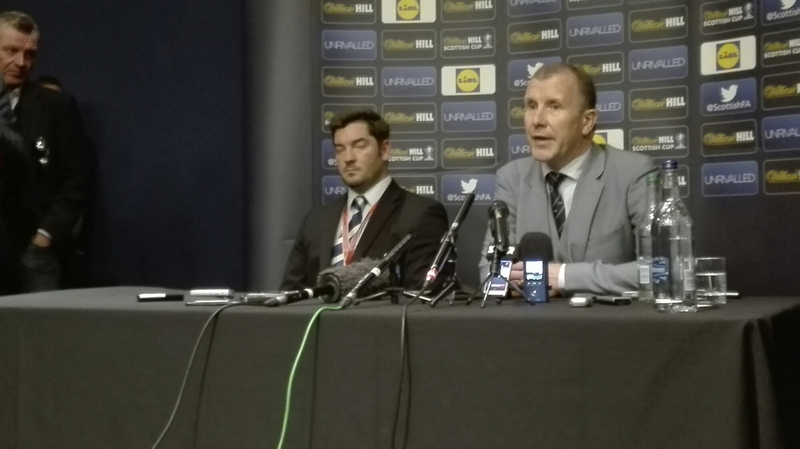 A as yet unnamed SFA official handed a box containing the Runners up medals to Rangers Young player Ryan Hardie who delivered the box to a Rangers dressing room that resembled a Accident and Emergency Triage station as several Players were assessed for injuries received from as yet unknown Violent Thugs from Edinburgh. It had been judged not Safe, let me just repeat that. IT HAD BEEN JUDGED NOT SAFE for Rangers Players and Staff to collect their Runners Up medals therefore surely it was not Safe for Edinburgh Hibernian to collect their Accolades in front of violent thugs dressed in Green and White. The recriminations have just started but Punishment must be given to Hibernian. It seems obvious a few hours after this Showpiece Shame that the diluted slap in the wrists given to Motherwell after last year’s Over Exuberance in the Second Leg of the Play Off Final was not enough for Fans to think running the length of a Football Pitch to goad Rangers Fans into engaging in violence. It is important to remember Titles and Cups can be withheld at Grace of SFA. No Cup was awarded in 1909 due to a riot on the pitch. It’s not inconceivable that the longest No win streak in Football history could easily go the same way as Lance Armstrong seven Tour De France victories. Imagine the Over Exuberance of Hibs then. Just as several should expect a Knock on the door for their actions following the Match, Rod Petrie, Leanne Dempster, Alan Stubbs and Co should expect a knock on the Door of Easter Road asking for the Trophy and Medals to be Returned. The options for Punishment from the SFA are limited given they were hosting the Game having clearly taken advice from Police. This game was Category C(IR), the highest possible Alert Category C with Increased Risk tagged on for good measure. That’s how seriously Police Scotland treated this Game. The Punishment options available to the SFA are incredibly limited. FINES did not create a culture of restraint following the near Riot at Fir Park Motherwell last year, so a monetary punishment alone has been proven to provide underwhelming results. Hibs could be banned from defending their Trophy indeed banned from Scottish Cup for a number of years the precedent for this was set By UEFA banning ALL English Clubs from European Competitions and Liverpool Football Club for an addition couple of years. This would not negatively affect a Club that hadn’t won the Cup for over a century, indeed it would turn out to be a positive cutting out fixture congestion in a busy Championship Season. It is a with regret that I am minded to think the only punishment available to SFA that has any teeth is in fact Hampden withholding the Trophy with fines and even a tournament Ban. The only way to stub out the returning Spector of Football violence within Stadia is to hit the Club hard. The weakness of previous Punishments came back to haunt the Hampden hierarchy there could be no ambiguities Hibernians Crimes happened right in front of them on their own pitch at an event they staged. Even Arsene Wenger would of seen it! Rangers fans and Staff are already feeling targeted, two Seasons in a row Rangers Fans have been subject to rival fans running the length of a football pitch to attempt to attack them. Don’t get this wrong Rangers fans and Staff do not demand to be universally loved and warmly welcomed to every ground in Scotland by every Club and its fans. Rangers fans do demand to expect to attend a Football game without having Morons charging at them demanding a “Square go”! Add in the basic Working Conditions of Rangers Players and Staff who would consider not being assaulted at work as the kind of request that should go unsaid by everyone of working age. Society has clear Zero tolerance rules in every workplace currently apart from Scottish football. There have already been calls to the Club to Ban ALL AWAY fans from Ibrox next year. It’s not a bad call when you see Parents hearding their children out of a Stadium because of the return of the bad olde days then you know the book needs thrown at Hibs. The Family freindly image hard won in years since Football Casuals created the deadly cages of Hillsbourgh Hibernian Football Club have dragged Scottish Football back into the the Dark Ages. The excuse of they are not Hibs fans fails when you check the receipts all the tickets sold to Thugs was sold via Hibernian Football Club. The question stands why did Hibernian with a average home attendance of TEN Thousand receive a ticket allocation of TWENTY ONE THOUSAND. Hibernian received and SOLD 210% of their normal home ticket sales. Inherent in condition of sale is taking the name of all who occupy a seat. So Hibernian should know who they sold the tickets too and if they want to distance themselves as a Club from the Thugs then it is a paper thing excuse. 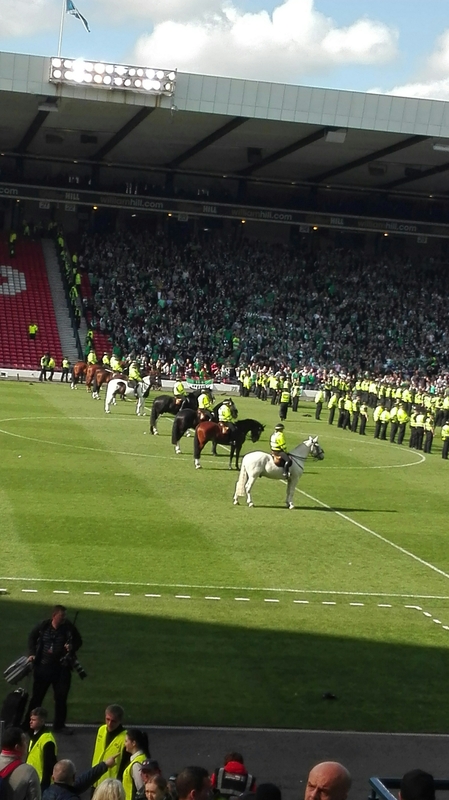 Congratulations Hibernian for ending a long history of Police Horses Free Hampden.